Hyacinth Gypsy Queen is as beautiful as it is fragrant. The blossoms are an apricot-salmon color and do not fade with time. The low growing plants are perfect for the front of a flower bed or to extend color in the spring garden mixed with bright colored tulips such as Princess Irene or Princess Margaret. 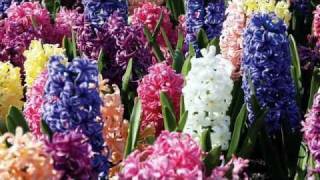 Nothing is more fragrant in early spring than hyacinths; they are easy to plant, require very little maintenance, come in wide range of colors and are excellent as cut flowers.